My family seemed to know that they were a part of history; not that they were notables or history makers for anyone other than their own loving family, but a disproportionate amount of them (women included) seemed to have a desire to keep a record for the future. Now, in a slowly shrinking family, I feel called to make sense of their stories. My daughter will not have the same thin connection that I had with the First World War, and even the Second World War seems so far away. So many crumpled, tarnished pictures are stuffed into crates; my family history. A dutiful caretaker, I have tried to share and protect them as best as I can. There is so much to do- so many stories and pictures fighting for my attention. On rainy, ice covered days like these, there are a few extra hours to spelunk into the boxes and come up with a rare discovery, or a new event to place on the timeline of our history. I found so much today. So many faces lost to history: World War One, World War Two and social …. This one was wrapped up like the rest: scroll fashion, tight- holding their secrets. Unwrapping them and scanning them was a challenge at best. It provided a rare opportunity for me to get my seven year old involved in the past and historical exploration. I apologize for the quality, but if I don’t put them up now, they might be lost for good. 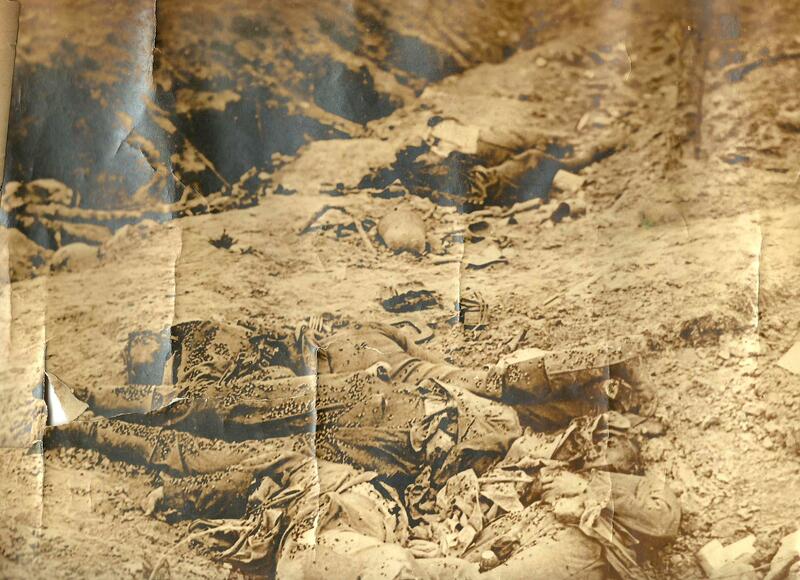 It is a harsh photo; a captured trench and at least two men – their bodies unburied. War and conflict will always tarnish care and dignity. This entry was posted in historical, historical media, history and literature, old photographs, Photo of the Day, primary resource, Uncategorized, World War One and tagged Captured trench, old photo, Primary resource, World War One, WW I photo, WWI. Bookmark the permalink. Thank you for taking the time and care to do this. I have recently been reading my great-uncle’s diary from WWI when he was with the 13th Battalion – fighting the the same area as your family. The timing is incredible that as I would just start reading his words, your images would appear. Please keep up this project – it is a very worthwhile effort and much appreciated. Thank you! I would love to hear more about your history too. It is always wonderful to find like minded people! Good luck with your own investigation and your great-uncle’s journal!